The focus of the Geography course is to build upon the skills that the students have gained during their earlier studies of the subject. Throughout Years 7, 8 and 9 students are encouraged to develop a spirit of geographical enquiry through units that will develop their research, presentation and ICT skills. Further skills development includes the use of atlases and maps as well as numeracy and literacy throughout. Year 7 begins with a unit on map skills and developing an understanding of the local area of Cobham. Further units explore settlements and the tropical rainforest, which is developed with our study of weather and climate. Fieldwork opportunities in our School environment allow students to explore these ideas and develop teamwork in collecting data. Another fieldwork opportunity presents itself in our final topic of ‘Food and Farming’ which helps students understand where their food comes from and enables them to make informed decisions about what they eat. 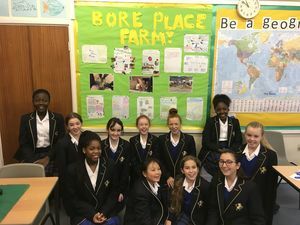 The Year 8 Geography course aims to study a range of different environments, introducing students to the issues that exist there and show how humans can have a role in their management. Independent enquiry skills are developed in their study of sustainable tourism, as well as role play and debating through our study of energy and resources. In a global context, students investigate how human activity impacts our world and how they can play a part in reducing those impacts. A sense of awe and wonder is developed through our study of fantastic places and students are encouraged to investigate and theorise about the great mysteries of the world. The Year 9 Geography course aims to develop a range of skills and understanding of topics that will be taught at Key Stage 4. They study world issues that directly affect them through the topic of oceans under threat and development dilemmas. They also study physical geography in the field in their river studies. Topical human geographical concepts such as globalisation allows students to appreciate how interconnected the world has become and studying population and migration leads to in-depth work on development issues offering students the chance to question the accepted world order and their own attitudes and values. At GCSE level, students study many of the major issues affecting the world today. How can we manage fragile environments effectively? What are our industries doing to the environment? How is globalisation creating a global village? How can people respond to natural hazards such as flooding, earthquakes and hurricanes? How can we limit the damage done by rivers and coastal flooding? Geography has a unique role in linking the Social Sciences (Human Geography) and the Earth Sciences (Physical Geography) with the opportunity to study the impact people have on the environment (Environmental Geography). Geography helps students to understand how these physical and social processes affect people and places worldwide in everyday life as well as in the longer term future of the planet. The Geography A Level has a balance of exciting and contemporary human and physical themes. It concentrates on dynamic landscapes and dynamic places, allowing the processes of change to be studied and analysed. The A Level qualification also enables students to explore and evaluate contemporary geographical questions and issues such as the consequences of globalisation and responses to hazards. A wide range of skills will be developed throughout the course including the use of GIS and fieldwork skills.